Our strategic partnership with Okta gave us the opportunity to explain why combining a CASB with a single sign-on (SSO) solution is the best approach for securing data on any device, anywhere. Carla Riggi, Director of Product Design, beautifully explained how we seamlessly integrate with Okta during her speaking session which drove tons of traffic to our booth. She gave a very interesting presentation about cloud security using Bitglass and Okta, explaining the importance of why businesses must secure their data as they continue to migrate to the cloud. When you pair Okta with Bitglass, the next-gen CASB, you gain best-in-class data loss prevention, encryption, access control, and much more. Dozens of people attended our talk and it was a highly productive session. All in all, the week was filled with great conversation and great networking opportunities. The lunches and happy hours gave us a chance to meet other security professionals and get to know their perspective on security. 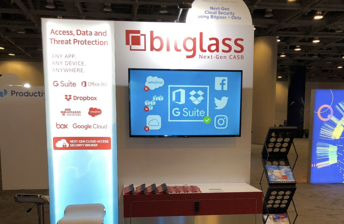 We also gained lots of positive feedback about the Bitglass CASB and the real value it brings to organizations operating in the cloud. We are looking forward to returning to Oktane next year! For information about how CASBs like Bitglass secure data, download the Top CASB Use Cases below.